Today, we’re talking with Lucas from Jive!, one of our longtime partners. 1 - Jive! has been our partner for a while now, and we love you guys more and more each month. 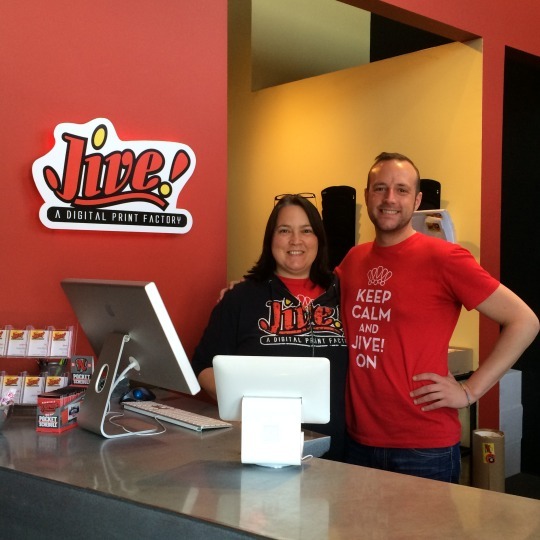 Tell everyone a little about what Jive! does and what you are focusing on for the year ahead? What Jive! does, fundamentally, is not a revolutionary thing. We print. What we try to do within that context, however, is deliver something different than the usual status-quo experience. We pursue consistently higher quality in the work, for one. Our approach is fresh and fun, and we shun the corporate-driven, amateurish vibe you get at national retail copy shops. Nashville has a proud and thriving tradition in the print industry, and we respect that, but we’ve seen a lot of benefit in not just providing the same old dusty lobby in a warehouse. There’s a heavy deal of hospitality that we bring to the transaction. Our whole crew has an artistic background, as well. Chances are, a person with a design background is seeing your project at every level, and that really helps us not only keep a pulse of what’s going on around the business, but to elevate our quality control. This year, as we celebrate our tenth anniversary, we’re continuing our recent efforts to spread the word about the more diverse services we offer. A lot of people don’t know how much more we can do in large format, screen printing, digital creative, etc. We’re a creative consultancy that happens to run a print business, and we seek to be as much a partner and utility to our clientele as we can. 2 - Nashville is, of course, Music City, what’s currently on rotation music-wise at your office in Cummins Station? As many folks know, we involve music heavily in the Jive! experience. We have a music video stream running 24/7 in the lobby. This comes from the generational DNA of the leadership here. Many of us grew up with that medium of music as a key influence, and we all enjoy the blend of visual media with sound. Our playlist stays up to date with current hits as well as classic well-loved videos. My personal faves that come up in the rotation lately are Sia’s unique videos and Uptown Funk - which might be the best pop song out right now. And, I’m always down for some old-school Dr. Dre, anyway. Strolling through the office, you’ll get a huge diversity among our team, from my process-driving EDM or classic rock to country twang. It can really depend on the mood, day, and person. 3 - What other causes or organizations have you partnered with at Jive? What events do you get behind in addition to CreativeMornings? Chances are high that any group or event that’s good for our city, key to the networking of the design and marketing industry, a good cause, or just a great vibe with who we are will see some level of support from us. It’s one of the many things we do to stay connected with Nashville. We’re so grateful to be part of the scene here, and this sort of support is a huge part of our ability to show it. We’ve partnered regularly with AAF Nashville, The Nashville Scene, The Tennesseean, The Tomato Arts Festival, Brew at the Zoo, Live on the Green, TEDx, Nashville Cares, Susan G. Komen for the Cure, Hands on Nashville, Shakespeare in the Park, most of the major art schools and many more. 4 - I know the creative community keeps Jive! busy with a multitude of different projects. Who are some local artists you work with and what are some recent projects you’ve completed in support of their ambitions, ideas and projects? Keith Brogdan (Thinking Out Loud Design) - Always has creative posters for different clients and events. Revive Health - bringing new ideas to the table about how to be creative with meetings and marketing parameters. Jen Hurst - Up and coming “scripter” - creates great sayings using different hand-drawn lettering for wedding invites, postcards, and gifts. We printed her first one and she has been printing almost non-stop with us since. 5 - The city has changed quite a bit since Jive! opened it’s doors. How have you adjusted, changed and grown since your initial opening? Having a front-row seat to all that’s happened outside our front door in SoBro certainly has been a very real symbol of change. We’ve found that one of the biggest changes inside Jive! has been technology. We’re doing more in less space and with far better communication and payment options than ever before. Printing equipment has gotten smaller, processes less costly, and the prevalence of creative tools in the hards of more folks in business has certainly increased. The volume of small business work we do matches up to the exciting explosion of Nashville-based brands of all sizes, and the large scale work speaks to the increase in corporations setting down Nashville roots. Thanks so much Lucas and Jive! for all of your support.